This weekend I hit the Yard Garden and Patio show and got the shot in the arm I needed to get me really excited about spring. I only made it to two seminars, sadly, but they both were great. I headed over to the Right Plant, Right Place seminar (Dan Heims, Terra Nova Nurseries). I was feeling sort of "pfft" about it, but the main hall was getting crowded, I was getting tired, and I can sit happily for hours and listen to people talk about plants. It was a treat when they announced that Dan got stuck in Boston in the snowstorm and Maurice Horn of Joy Creek Nursery would be talking about using gravel in the garden. He described the process of designing a no-water hell strip for five of his neighbors, which was a huge success. Eventually he was asked to design some large hell strips around Reed College. They would receive no supplemental water and they were comprised of the heavy clay soil that's so prevalent here. He talked about two different things: soil prep and great xeric plants. Xeric plants thrive on very little water but their crowns tend to rot out in our very wet winters. In order to prevent this, they use gravel as mulch, which wicks moisture away from the crown of the plant. They also amend the soil with two inches of quarter ten crushed basalt and two inches of compost. The type of gravel is important. You want crushed basalt, not round gravel, because it travels down into the clay and breaks it up better. Quarter ten gravel has also been washed, which means you won't get fine particulate floating to the top of your beds and forming a concrete crust. He's also been experimenting with applying gravel to areas of standing water and top-dressing them with compost. This breaks up the water tension and allows the water to percolate down. They have a great article on their blog about how to improve your lawn using 3/4" of gravel and a top dressing of grass seed. 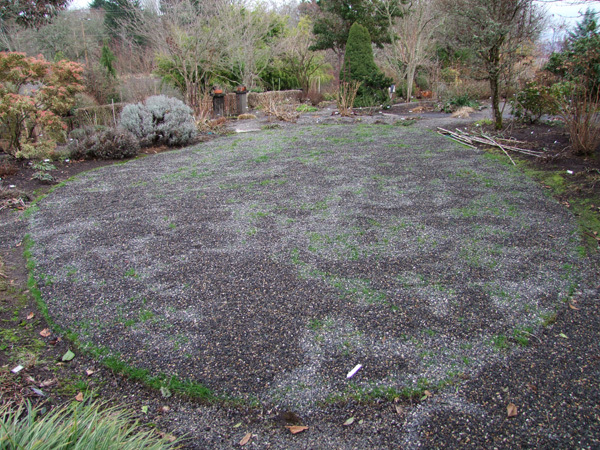 The old lawn grows up through the gravel and the new seed germinates on top. 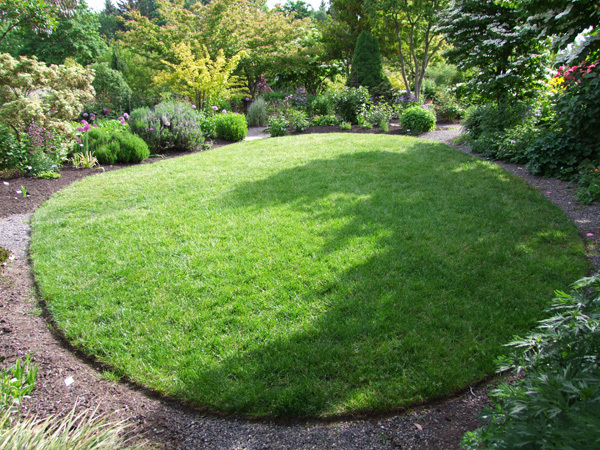 You end up with an even lawn (you use the gravel to level uneven spots) that requires less water, less feeding, and stays green longer. 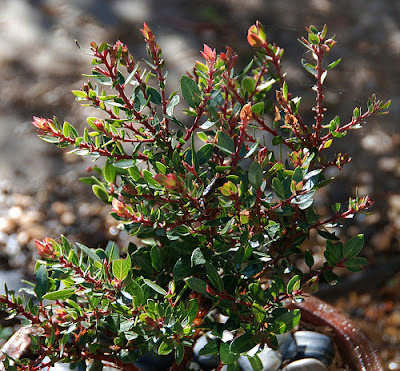 Arctostaphylos 'Greensphere,' a "perfect small shrub" whose only drawback is that it grows very slowly to 3' x 3'. Ceanothus 'Dark Star.' Maurice says he loves all the Ceanothus but he probably uses this one the most. 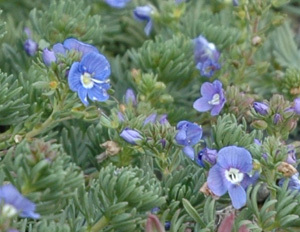 Dark green leaves and dark blue flowers. 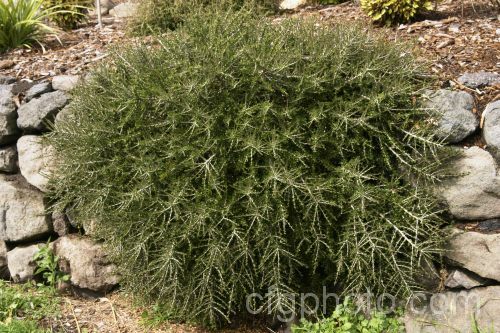 Melicytus alpinus (Hymenanthera), a textural bony plant to 2.5' x 2.5'. This one is covered in intensely white fruit all winter long. 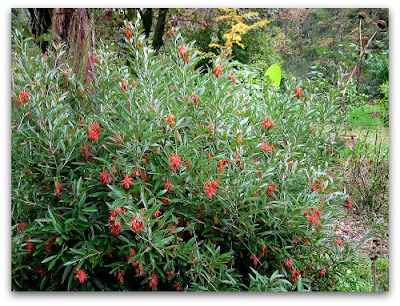 Grevillea victoriae, a 6x6' shrub that blooms nine-plus months per year and requires almost no water. Cistus 'Elma', which has large white flowers and dark green foliage covered in an aromatic resin that apparently smells amazing. 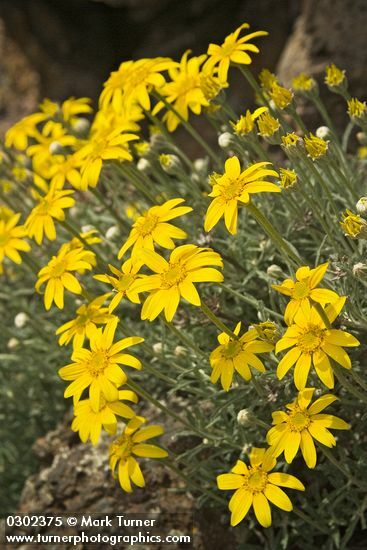 Halimium pauanum, which has saturated yellow flowers and an eventual size of 2.5' x 2.5'. 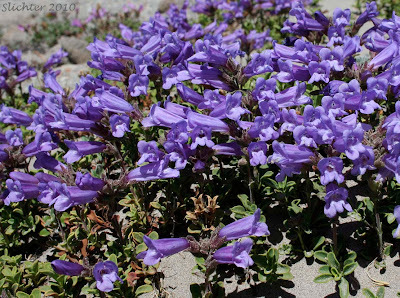 Salvia greggii 'U.C. Pink', a hot hot pink bloomer six months of the year. 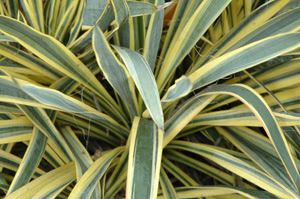 Yucca 'Bright Edge', a strap leafed plant that tinges red when the weather turns cold. Oregon Sunshine (Eriophyllum lanatum), an underused Oregon native that forms a silver mat smothered in yellow flowers. Sedum kamtschaticum 'Variegatum', which blooms twice and does well in the shade of shrubs. Veronica armena, whose foliage is like pine needles. 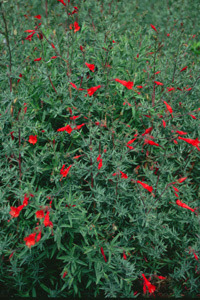 Zauschneria 'Bowman's Hybrid', which Maurice likes to use to camouflage the dying foliage of tulips. 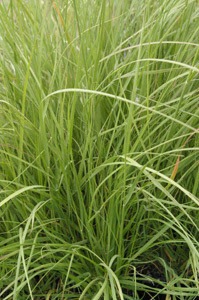 Muhlenbergia rigens, which Maurice warned to never cut back, as it will take years to recover. 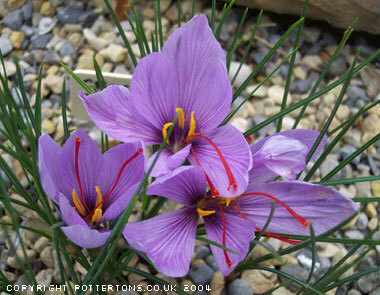 Crocus sativus, or saffron crocus. This talk got me so excited to replant my hell strip and try the gravel method on our lawn where the bobcat compacted everything. My hope is to avoid watering in the front yard more than once a week in the summer, so I'll definitely be planting a lot of these. I'm sure Dan's planned talk would've been great but I'm happy that Maurice subbed in. It was just the information I needed. 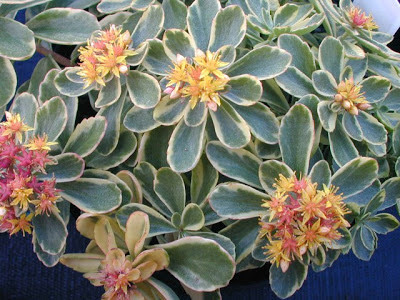 Thanks for sharing this info about which plants to choose and the cautions that go with them! We did the gravel-on-the-lawn thing two years ago. It worked great for the first year, but I think we need to do it a couple of seasons in a row. It cost almost $500 by the time we had everything delivered, so...probably won't be able to spend that much on the yard this year. Now we have moles, maybe? I don't know, it's a mess back there. Lucky me...6 miles from Joy Creek, so I can just pop over there on Sundays to hear lots of great seminars. This talk by Maurice was one of my faves. I can't tell you how many times I have passed on the info about the type of gravel (invariably people mention using pea gravel...which I agree is better looking, but not nearly as effective). What a great palette of plants! I especially love the Grivellea and Veronica. I've been thinking of trying the gravel lawn thing too. I'm wondering why you feel yours needs to be done again? It sounds like a lot of hard work (not to mention the expense--WOW) so I am nervous about going for it. He did say that they add more gravel periodically, though not as much as that first time. Did you end up with bare patches or how did it fail? The first summer that we did the gravel was just great and I was quite pleased with it. The lawn was less bumpy and healthier. I guess maybe I'm just a bad lawn owner? We get by with just a reel mower and I don't water it out of stubbornness. Probably if I took 2-3 seasons of treating it really well, it would be in better shape. We are at the base of Mt. Tabor, so it may have something to do with the volcanic soil, too. As far as the price, that could be greatly reduced if you have a pickup truck (eliminate the delivery fee). Oh man...I wish I had gone to that seminar, drat! I've often wondered who planted those areas around Reed...they are really lovely. So glad I saw this before I cut back my Muhlenbergia rigens...yikes! I wish you had been there too! It was surprisingly empty.